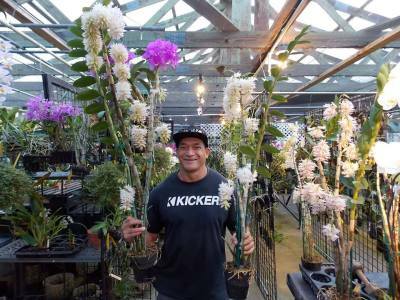 Kawamoto Orchids brief summary on how to maintain your Orchid Plants. 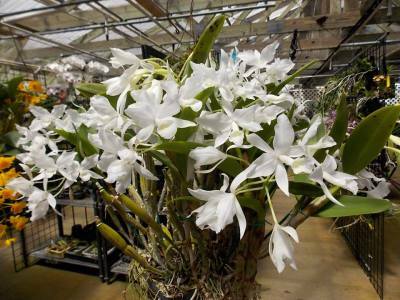 Valuable orchid care and Orchid culture tips that will help with fertilizing, light, watering, humidity, etc..
Place orchids in a location where there is bright light, but not in direct sunlight. 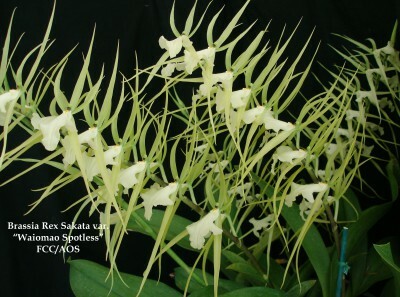 Most orchids like bright filtered light or early morning direct sun. Usually, a southern or eastern exposure will provide the light you are looking for. Make sure there is good air movement around the plant near an oscillating fan or an open window. Moving air prevents disease, Fungus, and bacteria which tends to germinate on wet surfaces. Providing humidity around the plant is very important. Placing your orchid in the bathroom can be an ideal place since there's usually a window to let in light and a hot shower once a day provides excellent humidity. Having a fish bowl near your plant or using humidity trays, humidifiers and fountains work just as well. You can also mist the leaves on your plants daily, this will help keep your plants nice and lush. Unlike most of our familiar houseplants, orchids are adapted to conditions that experience not only seasonal variation in temperatures but also significant day/night variations as well. 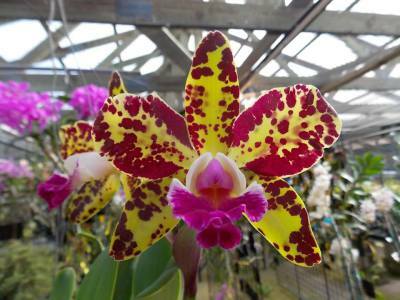 Most orchids can handle temperatures ranging from 70's-80's during the daytime and a low in the 40's at night. Orchids like to be in tight pots and let their roots travel and fell up the pot. Use media that drains well like sequoia bark, coconut husk chips or Orchiata bark from New Zealand. 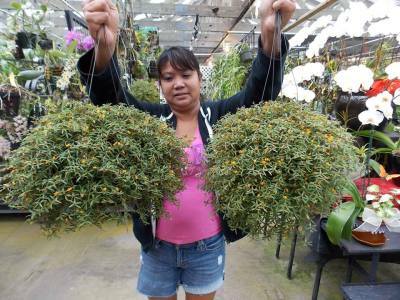 We usually recommend re-potting/transplanting every 2 years and upgrading the pot size about 1-2" inches. Water your orchid when the media in the pot is dry and your pot feels light when lifted. Usually a once to twice a week watering is sufficient (Drench the plant throughly). Water heavily only in the mornings and make sure the plant gets good air movement after. We are currently using a fertilizer in our water system: Peters Excel (cal-mag) 15-5-15. Our suggestion is to fertiize once every other week. You do not have to use the exact type of fertlizer that we use. Many people are having sucess using a 15-15-15 or 20-20-20 that you can purchase from your local garden stores. Just remember to fertilizer your orchids twice a month and hopefully they will flourish for you.